TwinSpires Blog: Dubai Super Saturday: Win a Cap, Earn 10X Points! 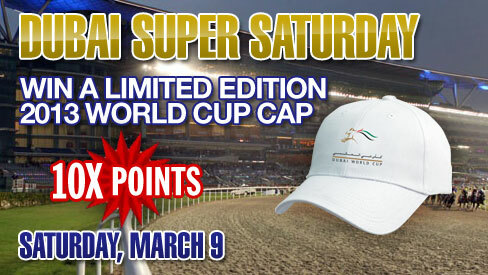 Dubai Super Saturday: Win a Cap, Earn 10X Points! With Breeders' Cup Turf Champ Little Mike and Pacific Classic winner Dullahan prepping for the Dubai World Cup, the excitement building around the Super Saturday program from Dubai has never been higher. 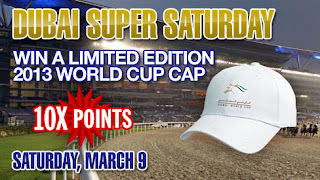 Plus, when you wager $50 or more on the Dubai Super Saturday program with TwinSpires.com, we'll give you a chance to win a Limited Edition Dubai World Cup Cap and 10X TSC Elite Points for all your wagers on the card. -- 10X TSC Elite Points per dollar wagered on the Dubai card. -- All Players will earn 2 TSC Elite Points per dollar wagered to be credited the next day. -- Qualifying Players will earn an additional 8 TSC Elite Points to be credited by March 12. Be sure to set your alarms early this Saturday, as the Dubai card gets underway at 8:05 a.m. Eastern, 5:05 a.m. Pacific Time. Dullahan will appear in the 6th race on the card, the $200,000 Burj Nahaar (G3) at 10:25 a.m. Eastern, 7:25 a.m. Pacific Time. Little Mike will contest the 7th race, the $400,000 Al Maktoum Challenge (G1) at 11:00 a.m. Eastern, 8:00 a.m. Pacific. The Maktoum field also includes last year's World Cup winner, Monterosso. Only one entry allowed per Player, regardless of method of entry. Mail in entries must be received by Monday, March 11, 2013.